We met with Hahm Eunjung, who is like a cherry blossom that returns alongside Spring. Once again as actress Hahm Eunjung. Similar with her girl group activities, Hahm Eunjung is persistently challenging herself in the acting environment and has recently made a significant breakthrough in Thailand. She made a great stride recently by acquiring the lead role for the Thailand movie ‘Mind Memory’ which premiered last 23rd of February. Ranking 1st in ticket sales in Thailand, the movie ‘Mind Memory’ draws a romantic story between Thailand top star James Ma and Ham Eunjung and received hot supports from local fans. It is a Sci-Fi-Romance movie involving a daughter of the CEO of a Korean software company, Minji (Ham Eunjung), who is interested in the software developed by a rich and elite young Thai man, Pat (James Ma). Having tried horror and romantic-comedy before, this time she successfully transformed into a mother’s friend’s daughter (perfect person) image. BNT News exclusively met up with Eunjung who has once again changed herself into a brand new image. 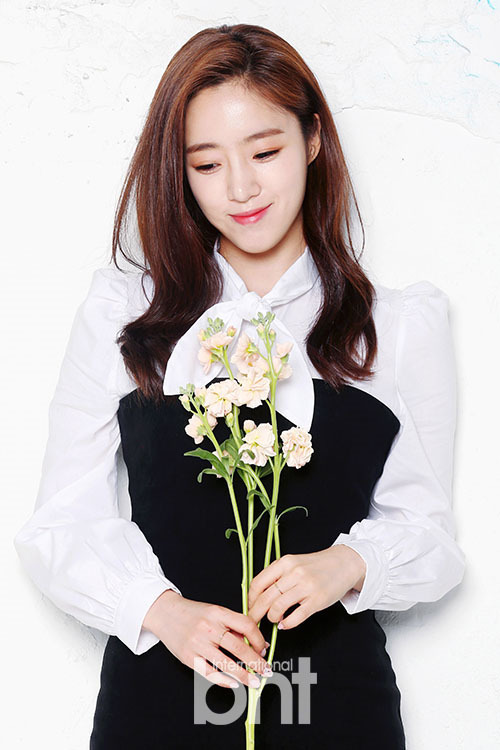 Ham Eunjung said that she wanted to be remembered as a kind person in the future according to her past BNT pictorial. It has been 2 years since then, it is now March and filled with the warmness of Spring. Our interview with her this time is filled with warmth, liveliness and feminine shyness. Q. How was the local response? Mind Memory was released on February 23rd. I’ve been hearing that Valentines’ Day has been switched from the 14th to the 23rd of February instead (laughs). It was a romance movie that was anticipated to this extent. There was a lot of local presence. There were also many reporters present during the premiere, so I thought that was quite a local response. Q. What kind of movie is ‘Mind Memory’ that it was so anticipated? Q. It is said to be a sci-fi-romance movie. I’m curious as to what kind of romance there is. When you mention science fiction, most will think of space science fiction. But this movie contains many technology elements. The use of the term ‘science fiction’ in the movie is fitting as there are many aspects that are yet to be scientifically proven or has sufficient evidence to back it up. It is definitely different from the science-fiction we had in mind. Despite all that, one thing that’s definite is that this movie, unlike other movies, uses technology to serve as a medium for the start of the romance between the man and the woman. Q. While we’re on the topic of romance, I want to know your personal style of dating in real life. Um… compared to my character in the movie, I’m more of an adventurous type. My character is more of a serious and careful type. In the movie, even though the feelings are there, my character refuses to acknowledge it and broods over it, asking herself if it’s really the way it is. But I’m more straightforward in real-life and I don’t push-and-pull. Q. You’ve got your first role in a Thai movie. It feels like something different. Firstly, it’s my first time filming for a movie overseas so I am quite worried if I did a good job. The first task I assigned myself is to understand the culture of the country. If I am to film in that country, I have to familiarize myself with it. I wanted the locals to not see me as a foreign actress, but instead just a friend from another country. I think that way when the movie premieres, it will be in the mix altruistically. Of course I’m very fond of Korea, but it needs to be shown as much as I like it. Q. The reason you choose the movie? I’m was very curious when I read the scenario on what kind of synergy there would be between a Korean and a foreigner and what would happen next. It made me want to give it a try. (Laughs.) Of course it was very interesting as well, and I’m also curious about how the CG will appear. Q. Your thoughts on collaborating with Thai actor James Ma? Firstly, before I met him, I had already heard of him being a very popular star in Thailand. And I understood why the moment I met him. (Laughs.) He feels like an oppa despite being younger than me. He has very good manners and he takes charge on scenes. He also took care of me so that it doesn’t feel like I was filming overseas. It has been a good collaboration. Especially, about 80% of the dialogue is in English, and I am not well-versed in the language and that had me worried. Every time that happened, James Ma helped me like a teacher, taking care of the trivial things to make the filming more comfortable and I’m very grateful for that. Q. 80% of the dialogue is in English. Language seems to be the biggest problem present. Um… you can say that the English lines are very long and me doing English looks kind of embarrassing. There were quite a lot of English lines in it. But what I really felt was that language barrier was not that important. Even if we speak different languages, as long as we exchange our feelings and be considerate to one another, it is something possible. Q. What’s your personal favorite scene? It was also revealed in the teaser, it was a scene filmed in Suwon. The male and female leads are sitting under a big tree waiting for other casts. It was very chilly and the male lead takes off his coat and puts it over the female lead. And the female lead in exchange took off her scarf for him. (Laughs.) I think this scene is very natural and romantic. Q. Is there a character you want to play in the future or something you’re unsure of? There is no character that I’m unsure of. I’m actually afraid of many things but whens the camera pans on me, I lose that fear. I feel like I can shave my head, or be an animal… I think it’s fun to take on a challenge. I’ve done many roles where I experience a one-sided love; I want to take on a role where I’m loved by many. (Laughs.) Crime or mystery thriller is fine too. I’d also like to try a sad character like ‘Another Oh Hae Young’, or the opposite, like the role of a level-headed lawyer or detective. I think I’d like to try many roles. That’s why there are no roles that I’m unsure of. Q. Anybody you’d like to collaborate with? Q. Do you treasure singing or acting more? Ah. I’ve received this question many times. (Laughs.) I hardly think about this but I just can’t pick a side. They have different charms but they also have something in common with each other. When I sing, there’s a fantasy element that exudes a strong charm like it’s a short act. And when I act, I express my feelings, that would otherwise be expressed through dance and song, through words as I express them to fellow actors and actresses. The only difference is in the way I express myself, I look at both of them the same way. I think being able to continue doing both is a good fortune. Q. You look very passionate while acting. Is there an acting role model you look up to? Jeon Doyeon senior and Ha Jiwon senior. They’ve been my role model since I was young. They can absorb whatever role that is given to them; I admire their great acting skills. They digest the role so well that they look like a totally different person in different works. I’ve always I wanted to be that kind of actress and that acting should be done like that. We watch movies or exercise, there’s nothing special really. But I like these kind of ordinary things. Q. That’s right. When you have busy schedules, it’s nice to rest at home. You seem like a ‘stay at home’ style. Q. Any wish you have for 2017? Ham Eunjung who always conducts every interview with lots of aegyo and sincerity. She might have said an earnest wish but there’s actually another wish. She’s a great fan of actor Colin Firth and hopes that the release of Kingsman 2 won’t be delayed any further. In other news, she is casted in the upcoming MBC daily-drama “All Kinds of Daughters-in-Law” s the romantic partner of actor Kang Kyung Joon. She has never stopped challenging herself and enjoys changes. Just like Spring that will certainly come, and flowers will bloom and melt the frozen heart.